In that short period of time, Wallops Island will transition from a little-known launch pad for small research rockets to a major player in the U.S. space program. The Wallops Flight Facility on Virginia's rural Eastern Shore is small in comparison to major NASA centers like those in Florida, California and Texas. The site is near Maryland and just south of Chincoteague Island, which attracts thousands of tourists each summer for an annual wild pony swim made famous by the 1947 novel "Misty of Chincoteague." The Eastern Shore is dominated by forests and farmland, and Wallops Island's isolated nature, with marshland to its west and the Atlantic Ocean to its east, has also made it home to a Navy surface warfare combat center. 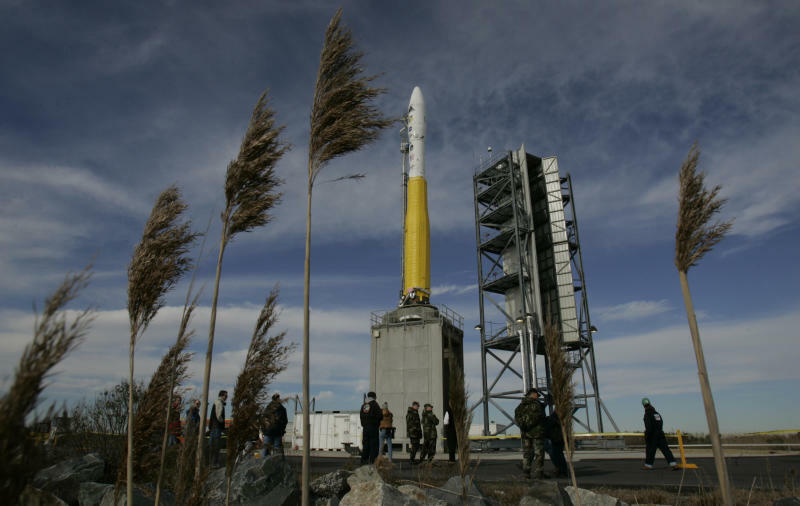 Those who work at Wallops Island joke that even people living on the Eastern Shore are surprised to learn about rocket launches there. In fact, more than 16,000 rockets have been launched from Wallops Island since 1945, but none has drawn the attention of Antares. Most of the launches are suborbital and focus on educational and research programs. "The real transformation here at Wallops is we've always been kind of a research facility," said William Wrobel, the facility's director. "So this transition is really kind of into an operational phase, where we're going to be doing kind of regular flights out of here to the space station." A successful launch would pave the way for Dulles-based Orbital to demonstrate that it can connect its unmanned Cygnus cargo ship with the space station this summer. If that's successful, Orbital would launch the first of eight resupply missions from the island in the fall under a $1.9 billion NASA contract. Orbital has been in the commercial space business for more than 30 years, producing small satellites and rockets for NASA and the military. Antares marks the company's first venture in medium-size rockets, which can carry twice as much of a payload as other rockets it produces. The space station delivery contract was awarded in 2008, and the company had originally hoped to launch in 2011, when NASA retired it shuttle program. In a partnership with Orbital and NASA, Virginia Commercial Spaceflight Authority built a $120 million liquid fuel launch pad at Wallops specifically for this type of mission. But there were numerous delays, and the state agency didn't turn over the launch pad to Orbital until October. That further put Orbital behind California-based competitor SpaceX, the second private company working with NASA on cargo resupply missions. NASA chose SpaceX to develop a commercial spaceship in 2006, and it docked with the space station for the first time in 2012. SpaceX's Dragon capsule returns to Earth after missions with science experiments and old station equipment, but Orbital's Cygnus is filled with trash and burns up in the atmosphere upon re-entry. "The fact is, there is not that much cargo valuable enough to warrant the additional cost that's inevitable when you try to return something," Orbital spokesman Barron Beneski said. "''It's a demand question. How much return cargo is there and does NASA need to order a Cygnus that can return cargo in addition to what the SpaceX capsule does?" 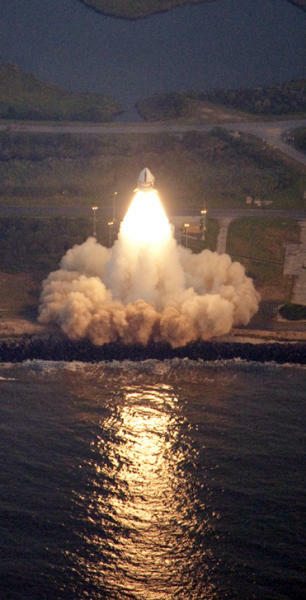 Landing Orbital's business was seen as a major victory for Virginia over Florida, which has a storied space history as the former home of U.S. manned spaceflight. But Beneski said Wallops Island had several advantages over Florida, including Wallops Island is a smaller facility and not as busy, he said. "The Wallops range for flights like this is not very congested. It's not that busy with other satellites going to orbit because sometimes you can have schedules overlap with other missions," he said. "Down in Florida, they launch a lot of high-value national priority missions, so potentially you can get bumped on the schedule, and of course, that would cost money." Virginia officials say the publicity associated with Antares should help recruit other space and technology companies to do business on Wallops Island, particularly those interested in launching satellites. "This launch is going to be a real watershed event," said Dale Nash, executive director of the Virginia Commercial Space Flight Authority. "We are getting into the big time."